I think as one embarks on a construction project there is always the understanding that something unexpected will come up. An unexpected waterline that had to be re-routed. An unexpected extra 1/2 inch on the bullnose edge of the countertop which made it impossible to open the fridge door. We budgeted for the unexpected. We prepared for the unexpected. We did not prepare for this. Yesterday as I was getting the girls ready for the day I heard a crash. Actually a crash does not begin to define what I heard. But I knew exactly what it was. I put Halley in charge of Janey and gave the girls strict instructions to NOT come downstairs. I needed some time to assess the damage. To get it together before they saw me again. Because after all, these are only dishes. It was only a cabinet. The granite did not break. The new floor is now scuffed, scratched and distressed just like the old floor. I might just have an excuse to buy these that I have been really wanting, but not really needing. Now I have three tubs of materials to make a mosaic. That what seems like a catastrophe now can be made into something else. To remind me that if faulty cabinets and broken dishes are the worst of my problems than I really don't have it all that bad. When I first saw your tweet regarding this - I seriously froze. I thought about you - I tried to picture it. I wished I could help somehow by magically reaching through my BlackBerry to you (now, wouldn't that be cool!?). oh so sad. My son even just gasped and said "what happened? It must have been a robber or an earthquake" So sad. Oh I love your positive outlook! And, you're exactly right, this gives you a chance to go shopping for the dishes you really want :) Happy shopping! I am still in shock that your cabinet FELL! So thankful no one got hurt. And, I am *pretty* sure your cabinet guys WILL be replacing your dishes! Your perspective blessed me. I can only hope that after having a good cry, I'd be able to see that clearly. Yes, they are only things which can be replaced. Thank God none of you were in the kitchen when it fell! Love all that blue though! Ahh I know how you feel. We shipped our wedding china when we moved and almost all of it was broken. Now its all broken sitting in our wearhouse waiting for me to make a mosiac. SO I would love to see the finishes project! And I love the confetti set! So very happy that no one was hurt. Also, a link to that necklace I mentioned that has inspired me, hope to finish my piece soon! No one is HURT, that's the good part, right? Great attitude and I love the polka dots! I'm so sorry. Your beautiful dishes!! Glad it didn't hurt the granite. I would have cried too. i can see the beautiful mosaic already though. Oh, no! I am so sorry. Love your fiestaware though:) I have the cobalt set... A mosaic is a wonderful idea! Here is the one that I did in my kitchen. It was so much fun to do! Thank the good Lord that all of you were upstairs...far, far away when it happened. And you're so right that they were only dishes, but I'm going to take a quick sec. to mourn a little for you, cause I have a feeling those pretty Fiesta ware dishes might have taken a while to all come together. You have an amazing outlook. Were you kind of cry-laughing? I would have been. Can't wait to see the mosaic. That is going to be an AMAZING mosaic! oh, julie. i almost cried when i saw this. all that aqua. but that is going to be an AWESOME mosaic! you can be strong! i believe in you. I've always wondered if that has happened to anyone. I load up my dishes and glassware into my cabinets and hope and pray they hold. I have little faith in the plastic reinforcements. So sorry for the loss of your dishes. Hooray for new art. Oh no :( I totally feel for you. Several months ago, my Hoosier cabinet doors' latch broke, the doors opened up, and out came spilling all my china. Somehow, only a couple of pieces broke. I bought it all second hand on the cheap, so I didn't really mind. Too much. And as for newly installed cabinets falling off the wall... I'm a teacher in a building that got renovated recently. They must have done a piss poor job installing the cabinets, because one fell off the wall just like yours did. Luckily no one was hurt because those things weigh a ton. Have fun with your mosaic project. I know it will turn out beautiful! Oh mercy~!! Well, I am so glad that you took this so well! I would have probably been a mess. If it's any consolation, I have recently had something similar happen to me TWICE. Actually, 3 times...but only twice did the closet shelving and aaaaaall of its contents totally avalanche onto ME. Oh hon, so sorry but yes, we all have it good! And, can't wait to see that mosaic... I'm so sure it will be beautiful!! Sooo sad, but what a wonderful outlook you have. As you said, they are just earthly things - which you will make into something beautiful, I'm sure! My heart goes out to you. This past week I dropped my camera bag and broke a very expensive lens. Shock and horror sets in and like you, I was reminded that it's "stuff" we can certainly get attached but we can't control everything which is a lesson I needed to learn (again). Have a blessed day! That is going to be one gorgeous mosaic! So glad you all were upstairs and cute little girl toes weren't running through the kitchen! oh my gosh...that is all i can say and think of! what a great outlook you have on it...i still can't believe your cabinet fell! How frustrating! Sounds like you have (or are at least working on) the proper persepective. So sorry! You have such a good attitude, bless your heart! Glad that all were far away from the scene! I hope you can get your dishes replaced with the ones of your dreams, and do the mosaic project! You WILL laugh at this one day. I gasped and scared my cats! So glad that no one was hurt!!! My goodness. Ugh. That gives me a little bit of a headache just looking at it! After my grandma passed away we were cleaning out her house & took her china...packed it up securely in boxes and shipped it to my house using a certain brown parcel service. After crying for a week I used it to make a mosaic picture frame & put a picture of my grandma inside. Not the same as her china, but still good. You'll make something fab. I know it. I'm SO sorry! How terrible! wow! i feel your pain and i love your attitude! way to keep it in perspective! those pictures show a gruesome scene!!! I stopped with my mouth open when I saw your picture.. So sorry... but LOVE your attitude. It will make it all go so much faster with such precious thoughts as yours.. Best of blessings your way.... and some fabulous new dishes too. I'm so sorry! Dishes are something that I know I treasure. So many memories over meals. ohhh my!! You guys are so lucky!! we had a similar experience when my oldest was a babe we literally just left the house when a large chunk of ceiling fell in from unknown water damage...YUK!! I bet there are extra kisses at bedtime for a few days :) I am excited to see your upcoming mosaic plans!! (((HUGS))) I would cry too, and I am so amazed by your positive attitude! I love how you made lemonade when life handed you lemons - mosaics - great idea! But oh, I definitely would have cried. You get the "best attitude on the planet" award for today! All I could think was mosaic, too. After I thought about how I'd also cry! oh Julie! I so can understand that incredibly overwhelming feeling of wanting time to turn back and pull the dishes out BEFORE the cabinet crashes. Oh My, what a mess!!! Thank God you guys were not in their! I got a feeling the cabinet guys got in some deep doo-doo with their boss! At least you will have a beautiful mosiac!!! Good for you for being so positive about everything!!! You're either extremely calm or trying to convince yourself. But either way, I totally admire your perspective on this whole thing. I believe the same things you stated...but it'd take me at least a few hours to calm down about it. Im glad everyone is safe. Youre right...its earthly goods(wood, hay, stubble) but its still very hard! Oh my gosh! I am so so sorry Julie! Wish I could have been there to help clean up. Your poor, poor Fiestaware. I would have so cried if ours all broke like that. But hey, you get to pick new dishes now! When I saw the picture I knew immediately what had happened. The same thing happened to us. It was horrible. Dishes from my great grandmother that couldn't be replaced. However, call your home owners insurance. My sister used to work for an insurance company and told me what to tell them it was covered under because they will try to tell you it is not covered. They replaced my cabinets because they couldn't match the old ones, replaced my counter and my floor but would not cover the cost of the dishes. But they were nice and gave me extra money for the clean up which helped pay for the dishes. My heart goes out to you. I am happy no one was in there to get hurt. We were lucky too! Best wishes. Wow, You have an amazing attitude! What a beautiful example to your children! could you hear me GASP! all the way in alabama??!! oh julie, that is just horrible. but, the bright side (there's always a bright side!) is that now you get to shop for new dishes!! F-U-N! and that no one was hurt! that too! You have such a positive outlook! OH NO!!!!! The lady I used to nanny for had something like that happen. The day she moved into her new house and put all her crystal (from her fancy wedding) in the cabinets, they crashed to the ground. We're talking dozens of WATERFORD crystal goblets, flutes, etc. I am so glad nothign like that has happened to me...I don't handle things as well as you! isn't it great that we have the great knowledge that "earthly goods" are only temporary and that God can turn beauty from ashes? :) i think you should keep one of those buckets of earthen ware as a display to remind you/us of the temporal state we are all in at the moment. what a display THAT would be!! BTW: your response was WAY more mature than mine may have been. Great job being positive when I am sure you just wanted to sit down and cry! 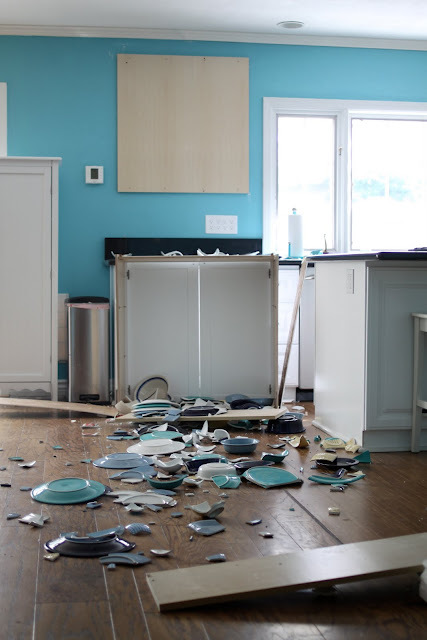 So sorry about your dishes, even though they are just things, it is sad when something that was perfectly fine is ruined in a moment like that! I am so thankful no one was in the room when it happened!! Make sure they double check all the other cabinets when they replace that one!! oh, i have had nightmares about that happening in my kitchen...i have to say you had a amazing outlook on the situation! can't wait to see what happens to your pretty dishes! oh my stomach dropped when I saw this-I'm so sorry! Glad you all weren't in the kitchen when it happened. I don't know if I would have handled this as well as you did! bless your heart - great perspective! holy cow. i am so happy the kids were NOT around. what a mess. can't wait to see what you get to replace it. have a wonderful day. sure is pretty outside. You have a great perspective on this unexpected event. I admire your determination to do something meaningful with it, rather than pout all day (which is probably what I would have done!). I totally feel your pain. A few years ago, I had a large hutch in my kitchen, glass shelves, all piled way too high with platters and the like. We were eating dinner one night in the dining room and head a loud, indescribable crash in the kitchen. My heart sank because I knew exactly what it was. Two of the shelves crashed, bringing everything down with them. I totally wanted to cry. And it was totally my fault. Just wanted to leave a comment to tell you I just read your story for the 1st time. I am amazed by mommy's like you. And I can't wait to see you in heaven one day with that sweet girl that never knew any different than Jesus. Amazing. You've hooked me for good now:). Thanks for sharing your journey. I'm so glad the Lord chose to bless you both 3 times over for clinging to Him. It sounds like you handled it all so very well. Nice Fiesta ware in the bucket for the mosaic project. Blessings that the room was empty. At leas the new floor is worn it right fit now! God bless and I enjoy your postings. Oh no! So sad and so scary! I am so glad it happened while you were all upstairs!! So great to meet you last night! I am glad to hear you literally "picked up the pieces and moved on" with such a positive attitude. Your awesome! Perspective is one of the keys to happy life, isn't it? I love how positive you are. To turn and make something beautiful such as a mosaic out of this small catastrophe is such a lovely perspective. Yet another reason why I love your blog!